Windsor was a Greek Revival mansion, built at the heart of a huge plantation at the eve of the Civil War. While the enormous house survived the war undamaged, it burned down in 1890 when it was reported that the fire broke out on February 17 when a house guess accidentally dropped a cigarette into some debris left by carpenters who had been making repairs on the third floor. Everything was destroyed except a few pieces of china and 23 of the columns, railings and iron stairs. 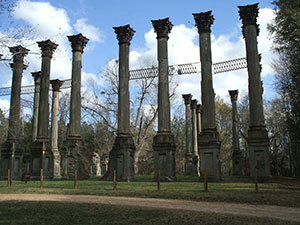 Today, the 23 ghostly columns in the middle of thick Southern “jungle” are a mecca for photographers. The site is famous, but you will likely be the only visitor there. There is no cost, no gate, no gift shop… just a dirt road. Two miles South of Windsor, you will find this old church from the 1840s. 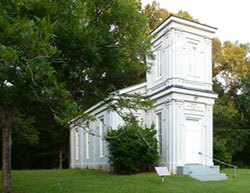 Ulysses Grant’s troops passed Bethel Church on April 30th, 1863 while moving to Port Gibson on the Rodney Road. The Hand pointing to Heaven” is the unique feature of this Romanesque Revival style edifice. The first hand was carved from wood by Daniel Foley, a young local craftsman. The ravages of time, however, destroyed it; and around 1901, the present hand was commissioned and installed. It was taken down in 1989 to be repaired and replated. It was raised again in 1990 and placed atop a newly re-enforced steeple.